On Monday, I will be attending Finovate East and posting updates here. I have often asked myself this question “How did they get the funding for their business?” especially when hearing about start-up businesses that have been around less than a year or two and have no discernible revenue model. Since I have work to do and have no time to “keep up with the Jones”, I just let it go but the question remains. It just seems like a good idea and hard work are not enough. 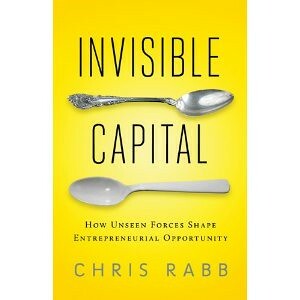 That’s why I am so excited to read Chris Rabb’s new book, Invisible Capital: How Unseen Forces Shape Entrepreneurial Opportunity. In his book, Rabb puts forth concrete and effective ways entrepreneurs and their advocates can build and grow sustainable enterprises amid these unseen forces created by society’s uneven playing field. It comes out in November, but you can pre-order it now. Full Disclosure: Chris Rabb is my cousin-in-law, and I am proud!